You walk into a local coffee shop to get some work done. After a few moments you realize the place is more crowded than usual. Several people decided a toddler was a wise addition to their caffeine ritual. The calm place you wanted is overwhelmingly chaotic. You stay for a short time, can’t get your work done, so you leave. People crave calmness when seeking information. That’s why libraries have rules to be quiet. 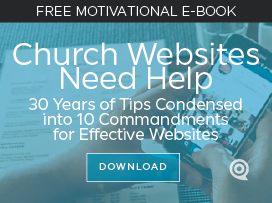 Your church website needs the same set of rules. We must calm our websites down. Most people spend only a few seconds on a web page looking for some quick information they don’t have. They want to find it quickly without any chaos. Yet our church websites are designed with chaos. And people spend less time on a chaotic page. Simplify the content. Have one purpose/page. When arriving on an interior web page, they’re usually looking for one thing. Ensure that your headline clearly states the purpose of the page, then deliver the content in a simple, clear, calm, scannable manner. Edit. Edit. Edit. Don’t give more than the headline promises (in the main content area). Sure, other options that may interest someone (ads, links, buttons) can be present but don’t let them overshadow the page. Make them all secondary to the primary content. Have text line up. If you have text areas, make sure the left side lines up (left justified). Avoid jagged centering of text. If you have content on the right side of the page consider right justifying it or full justifying the text in order to flatten the edges of the lines. Ensure designs are balanced. In design 101, artists are taught how to create simple designs (i.e. 4 boxes in a quadrant pattern). Pull one box away from the pattern and you create an unbalanced design. People find balanced areas calm and peaceful. They’ll want to stay longer. Scan your pages for ways to calm the design down. Reduce choices. The more choices on a web page the more chaos. Cluster choices and eliminate unnecessary ones. Some church website pages have 10+ separate choices. People often decide to choose none of them. They leave for a more peaceful way. Eliminate redundancy. In light of reducing choices, also remove anything that’s duplicated on the web page. Just to calm the page down. Simplify! Ensure readability. There’s nothing worse on a webpage than text barely readable over a busy photo. You ask people to visit an informational page and then punish them by making them decipher the content. People give up. They flee. Calm your design. There’s a reason flat design is taking over websites. Because eliminating drop shadows, overlapping elements, and transparent items, simplify your church website so people obtain the information they seek. Imagine! 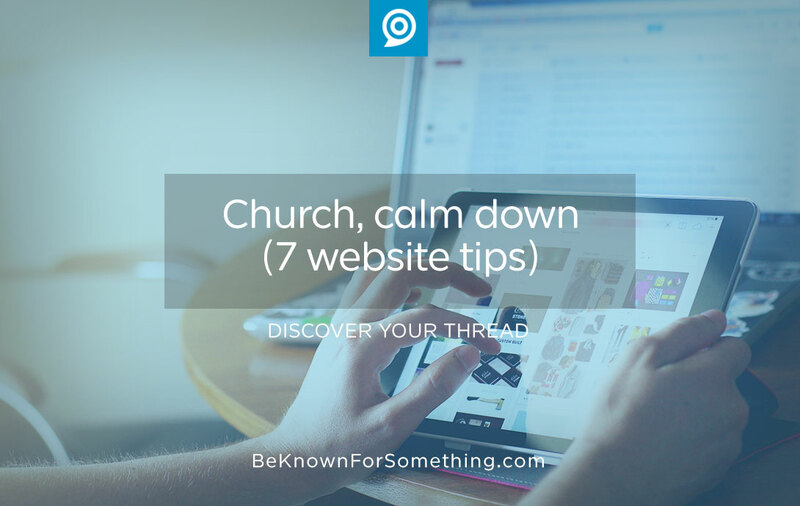 Church, calm down your websites and people will want to spend time there. And that’s the purpose!